Have your flooring needs taken care of by turning to our skilled flooring specialists. As a locally recognized flooring store, we offer an extensive selection of wood flooring for you to choose from. We have everything from traditional to exquisite hardwood products that are sure to upgrade any area of your home or business. With so many hardwood flooring options available, you’re sure to find the floors that best suit your needs in looks, performance, and price. Because of our affiliation with a national brand, we enjoy the buying power of hundreds of stores. That enables us to stock the highest quality products for the lowest prices in the area. We make it a priority to keep your prices competitive and affordable. Our priority is to make the floor-installation process fun and successful! From flooring selection to installation, our professionals will ensure that your flooring and design needs are met. Not only do we specialize in selling flooring, we install it as well. We offer personalized hardwood flooring installation services for any customer in need. When you hire our installers to complete your home improvement project, you are protecting your investment and ensuring its longevity. Each of our experts has the training to properly install any hardwood floor. To install your floors, we’ll first remove your existing covering. This is done meticulously to ensure the process is started smoothly. After the older material is removed, we’ll prepare the subfloor. The subfloor is the foundation of your top floor. It is important that it be prepped correctly. Once this has been completed, we’ll lay down the hardwood. Our team will pay close attention to detail when installing your material. Upon finishing your installation, we clean up any messes we created. We want to leave your home cleaner that when we arrived. You don’t have to worry about disposing any debris. Our professionals handle this as well. In addition to its aesthetic appeal, our hardwood flooring options are flexible. Solid hardwood can be stained or refinished to complement your home’s overall décor. You can customize it to fit your design scheme. If you need a flooring product to put in a room that is prone to humidity or can withstand scratches, we have a solution for you. Engineered hardwood floor is a preferred alternative. 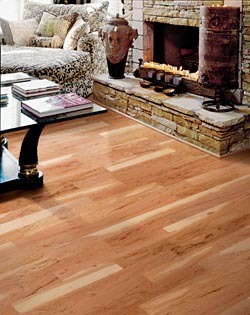 This type of hardwood is scratch resistance and long lasting. It works well in basements, bedrooms, dining areas, living rooms, and entrance ways. There are so many uses for this hard-wearing product that you may want to install it in every room. Besides solid and engineered hardwood, we our store also sells products made out of bamboo and cork. Both of these flooring options are perfect to use when renovating your house. Bamboo flooring has a unique look. It is also available in several finishes. When it comes to cork flooring, it gives surfaces a natural look. It is hypoallergenic, insect resistant, and very beautiful. We sell it in a wide assortment of colors, so you can complete any design project. Visit us today to check out our selection of bamboo and cork flooring products. Contact us to purchase room-enhancing hardwood flooring products. We cater to customers in Champaign, Urbana, Mahomet, Lake of the Woods, and Augerville, Illinois.